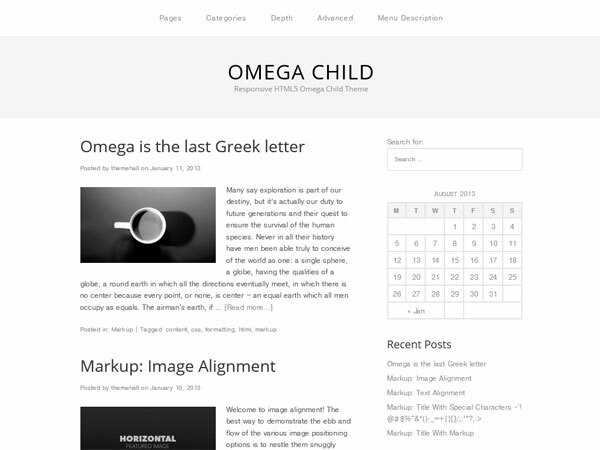 Omega Child is the default Responsive HTML5 Omega child theme for WordPress. Omega Child theme Inherits all Omega parent theme capabilities, and reveal big fat footer widget areas. Non Responsive version is available as well. Omega Child also gives you ability to customize footer text, copyright notice and remove credit link easily. Once activated, you will find the setting at ‘Appearance > Customize > Footer’. Excellent theme! Simple, easy to work with, and leaves a lot of room for creativity. Support with themehall.com is top-notch…super fast replies and quick problem fixing. This theme is wonderfully simple and has a huge emphasis on the content. By the looks of the support forum, Han seems to be very helpful. Very pleased! Thanks! The Omega is without a doubt the PERFECT theme for my genealogy blog! It's easy to use and customize to suit my needs. But most of all, its minimal elegant layout has really made it easy for family and visitors to navigate the entire blog and connect with me too. Thank you Themehall!